Several examples of Lioret cylinders, clockwise from bottom left, No. 1, No. 2, No. 3, brown wax, and No. 4 varieties. French clockmaker and inventor Henri Lioret first developed a talking doll in 1893 using a small celluloid cylinder, and by 1897 he had developed a completely original type of musical cylinder unlike that of any other manufacturer. Lioret cylinders were unique in their construction, comprising a brass tube with spokes covered by a molded celluloid sleeve carrying the grooves. He was the first to use the durable celluloid for cylinders (which Edison later adopted in 1912) and was also the first to develop a method of duplicating cylinders by molding. In the final years of the 1890s he was recording and manufacturing several sizes of musical cylinders to be played on his clockwork phonographs, commonly known as Lioretgraphs (though the different models had specific names). They played at 100 or 120 rpm and, depending on the type, they contained anywhere from 30 seconds (No. 1) to 4 minutes (Eureka No. 4) of music. The color of the label color initially indicated the type of music, with blue labels for songs, orange for instrumental solos, red for fanfares, green for harmonies, and gray for hymns. By 1899, Lioret's catalog listed nearly 1400 titles. Performers are not named or announced and catalog numbers are almost never listed on the cylinder, making precise identification and dating difficult. 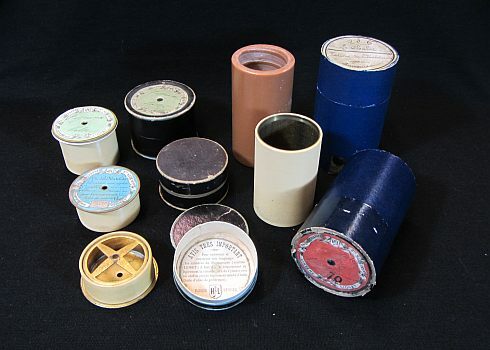 UCSB's small but significant collection of Lioret cylinders was originally owned by collector Ray Phillips and supplemented by collector John Levin.